Dress up in style this festive season with Anaya by Kiran Chaudhry, a collaboration between popular Pakistani artist and Resham textiles. Anaya may be a young brand but has already made their mark in the fashion and textile industry! Creating designs using the finest fabrics including chiffons, cotton and net. Using vivid color schemes the ensembles are modeled by the stunning Meera Ansari, who brings the outfits to life. Kiran Chaudry’s passion for art has truly spilled over into her enthusiasm in creating eye catching pieces for the fashion industry. A lovely collection of luxury pret wear consisting of the most elegant designs, this collaboration is definitely a hit in our book! Just in time for Eid, the collection is available at every major retail outlet across Pakistan. Start your Eid morning with their classic white chiffon outfit that comes with a fully embroidered back, pure organza sleeves and an embroidered net dupatta at extremely reasonable prices! Attend an Eid soiree in their coral pink embroidered ensemble paired with bell bottoms to create an ultra trendy look. Looking for something with darker hues? Opt for the breathtakingly beautiful silver/grey design for an uber stylish style statement- pair it with pencil pants and go full glam with a trendy updo! 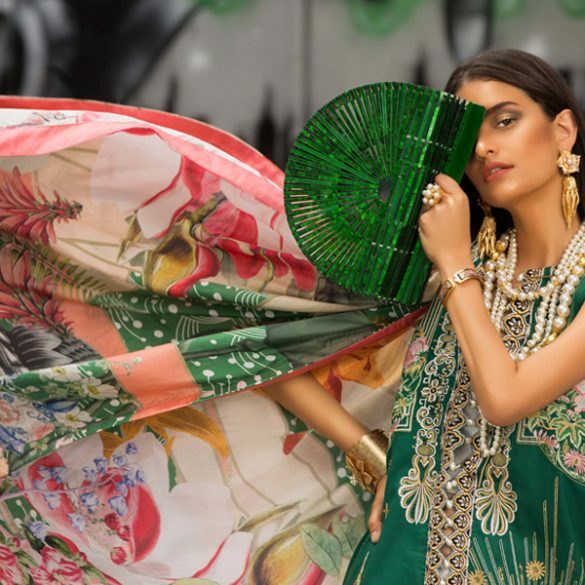 Anaya by Kiran Chaudry is most certainly a brand to look out for. Check out the exquisite range below! Whats in Store? : Sapphire's Eid Luxe Collection!